He and his wife, Masayo, have two daughters, Hinatsu and Wakana… father, Kazuhiro Kuroda, was a professional baseball player for the Nankai Hawks. Attended Uenomiya High School and Senshu University in Japan… was selected by the Hiroshima Toyo Carp of the Japanese Central League as a second-round draft pick in 1996. Waited tables at Pasadena's Panda Inn during the Dodgers' 2008 Winter Caravan… also made hospital visits to City of Hope during the caravan in 2008 and '09… donated $100,000 to the Dodgers Dream Foundation in 2009, with a portion of those funds going to the team's charity, ThinkCure!… also donated $50,000 to ThinkCure! in 2011. Pledged $50,000 to benefit Japanese tsunami relief efforts and organized a fundraiser at Camelback Ranch on 3/19/11 to raise money for the American Red Cross Japan Tsunami Fund. Pitched for the 2004 bronze medal-winning Japan Olympic Team, earning two wins in relief… in 1999, pitched in the International Cup in Sydney, Australia, earning a win over Korea and tossing a complete-game shutout vs. Taiwan. the longest winless stretch of his career (also 4/9-5/16/08 with Los Angeles-NL). Went 16-11 with a 3.32 ERA (219.2 IP, 81 ER) in 33 starts with the Yankees...established career highs in wins, starts, innings pitched and strikeouts (167)...tied for tops on the staff in wins (also Hughes) and led in starts and innings pitched...among AL pitchers, ranked fourth in innings pitched, tied for sixth in wins and ranked eighth in ERA...Also recorded three complete games and two shutouts, the first Yankee with multiple shutouts in a single season since Mike Mussina in 2005...Opponents batted .249 (205-for-822, 25 HR); LH .253 (120-for-474, 15 HR), RH .244 (85-for-348, 10 HR)...Faced the Rangers' Yu Darvish (on 4/24 at Texas) and the Red Sox's Daisuke Matsuzaka (on 10/3 vs. Boston), marking the seventh and eighth times, respectively, in MLB history that two Japan-born starters faced off against each other...Went 13-5 with 2.92 ERA over his last 24 starts from 5/27 through the end of the season, after opening the year 3-6 with a 4.56 ERA (53.1 IP, 27 ER) in his first nine outings...among AL hurlers, marked the fourth-lowest ERA over the stretch, and only David Price and Jered Weaver (14 each) had more wins during the span...Exactly half of his starts (16 of 32) were against teams with winning records at the time that he faced them, with Kuroda going 8-5 with a 3.95 ERA (107.0 IP, 47 ER) in those starts...beginning on 6/8, lost just two of his last 12 starts against ballclubs with a .500 or better record, going 7-2 with a 3.87 ERA (76.2 IP, 33 ER) in those contests...Held opponents to 2 BB or less in 27 of his starts, including 18 of his final 19 outings...his 2.08 BB/9.0 IP ratio was the sixth-lowest among AL pitchers...Tossed at least 7.0 innings in 18 of his starts, six of which he held his opponent scoreless...only Seattle's Felix Hernandez (seven) had more among Major League hurlers...Did not allow a first inning run in 17 of his final 19 starts after combining to surrender 12 R in the opening frame over his first nine outings...Won five of his eight daytime starts...had not recorded a winning daytime record in any of his previous four Major League seasons...Went 11-6 with a 2.72 ERA (132.1 IP, 40 ER) in 19 starts at Yankee Stadium, the AL's seventh-best home ERA...was 5-5 with a 4.23 ERA (87.1 IP, 41 ER) on the road...Averaged 15.2 pitches per inning, the fifth-lowest mark among AL hurlers...opponents stole 17 bases while Kuroda was on the mound, most for any Yankees pitcher...Handled 42 chances without committing an error, the most flawless chances by an AL pitcher in 2012...Tossed 8.0 scoreless innings in his second start of the season on 4/13 vs. Los Angeles-NL in the Yankees' home opener, becoming the first Yankees starter to throw at least 8.0 scoreless innings in a home season opener since Rick Rhoden on 4/5/88 vs. Minnesota (9.0 IP)...also became the first Yankees starter with at least 8.0 scoreless innings in his first start at Yankee Stadium (old or current) since Bob Shirley on 4/27/83 vs. Kansas City (9.0 IP) - credit: Elias...Over his final seven starts of the year vs. AL East foes beginning on 7/18, went 6-1 with a 3.18 ERA (6.2 IP, 20 ER)...prior to that, had been 1-2 with a 6.94 ERA (23.1 IP, 18 ER) in four starts vs. the division to begin the season...Recorded his fourth career CG (all shutouts) and second of the year on 8/14 vs. Texas...was the first 9.0-inning shutout by a Yankee, while allowing 2 Hs or less, since 7/28/06 vs. Tampa Bay (Chien-Ming Wang, 2 H)...became the first Yankee to toss a complete game SHO against the Rangers since David Wells on 8/21/98 at Rangers Ballpark...Allowed a seventh-inning solo HR to Adrian Gonzalez on 8/19 vs. Boston, snapping a career-high 16.1 IP scoreless streak...Threw 99 pitches on 8/31 vs. Baltimore, snapping a streak of 12 consecutive games in which he threw at least 100 pitches beginning on 6/25...had been the longest such streak of his career and the second-longest by a Yankees pitcher this season (CC Sabathia - 15 games, 4/6-6/24)...Went 0-1 with a 2.81 ERA (16.0 IP, 5 ER) in two postseason starts (ALDS Game 3 vs. Baltimore and ALCS Game 2 vs. Detroit) with the Yankees...Did not allow a baserunner over the first 5.0 innings of ALCS Game 2 loss vs. Detroit, becoming the first Yankees starter to carry a perfect game through the first five innings of a postseason game since Mike Mussina on 10/12/04 in ALCS Game 1 win vs. Boston (retired first 19 batters)...was his first career start -- regular or postseason -- on short rest...struck out 11 batters, matching his single-game career high (third time, first in postseason play)...became the fifth pitcher in franchise history to strike out at least 11 batters in a postseason game -- first since Orlando Hernandez in Game 3 of the 2000 World Series at the Mets...also didn't walk a batter, becoming the fifth pitcher in postseason history to fan at least 11 batters without issuing a walk (also Cliff Lee in 2010 ALDS; Sterling Hitchcock in 1998 NLDS; Tom Seaver in 1973 NLCS; and Don Newcombe in 1949 World Series). Went 13-16 with a 3.07 ERA (202.0IP, 69ER) in 32 startswith Los Angeles-NL... established career bestsin wins, ERA, games started, innings pitched andstrikeouts (161)... recorded the third-lowest single-seasonERA among Japan-born pitchers who qualifiedfor an ERA title in the Majors, behind only Hideo Nomo(2.54 in 1995) and Daisuke Matsuzaka (2.90 in 2008)... Opponents batted .254 (196-for-773, 24HR); LH .264(99-for-375, 12HR), RH .244 (97-for-398, 12HR)... held opponents to a .194 (30-for-155)batting average with runners in scoring position, the fifth-best mark in the NL... Ranked fifth in the NL with a 2.85 road ERA (94.2IP, 30ER), posting a 7-7 record in 15starts away from Dodger Stadium... Went 1-10 with a 3.38 ERA (72.0IP, 27ER) in 12 starts from 5/22-7/27...posted a career-longsix-game losing streak over a seven-start span from 5/22-6/25... received anaverage of just 2.25 runs of support (18R) during the stretch... Won a career-high four straight starts from 8/14-30, recording a 3.12 ERA (26.0IP, 9ER)with an average of 11.08 runs of support per start over the span... earned a win inseven of his last 10 decisions overall from 8/2-9/27, going 7-3 with a 3.00 ERA (69.0IP,23ER) in 11 games... Allowed a career-high 4HR in 9/5 loss at Washington, with all 5ER allowed comingvia home runs (6.0IP, 8H, 0BB, 9K). Set career bests with 11 wins, 196.1 innings, 159 strikeouts and a 3.39 ERA ... tied a career highfrom 2008 with 31 games and starts ... Struck out 159 while walking only 48 for a 3.31 strikeout-to-walk ratio, the eighth-lowest in theNational League ... Limited opposing hitters to a .243 batting average, which tied for the 18th-lowest mark in the NL ... His 3.39 ERA ranked eighth among National League qualifiers and was the seventh lowest all timefor a single season by a Japanese-born starter ... Was dominant in his 11 wins, posting a 2.13 ERA (18 ER/76.0 IP) and limiting opponents to a .211 batting average (58-for-275) ... also pitched well in his seven no-decisions with a 3.15 ERA (16 ER/45.2 IP) and .243 opponents' batting average (42-for-173) ... received two or less runs of support in 11 of his 31 starts ... Excelled in his 14 second-half starts, posting a 2.87 ERA (30 ER/94.0 IP) and limiting opponents to a .204 batting average, whichtied for the fifth-lowest mark among NL starters ... Walked just 48 in 196.1 innings for an average of 2.20 walks per 9.0 innings, which tied for the fifth-lowest mark in the NL ... issueda career-high five free passes (two intentional walks) on May 7 against Colorado ... Allowed an average of 0.69 home runs per 9.0 innings (15 HR/196.1 IP), the 13th-lowest mark among NL starters ... limitedopponents to a .351 slugging percentage, which was the 11th-lowest in the NL ... Opposing hitters missed on 24.8 percent of his pitches, which tied for the 14th-highest mark in the NL ... Made a career-best 21 quality starts, which ranked second on the club and tied for 16th on the Senior Circuit ... pitched 7.0 ormore innings in 15 of his 31 starts and tossed a season-high 8.0 innings on five occasions ... Combined to go 8-5 with a 2.10 ERA (25 ER/107.1 IP) and a .198 opponents' batting average (77-for-388) in 16 starts againstNL East and Central opposition ... went just 2-6 with a 5.09 ERA (40 ER/70.2 IP) and a .297 opponents' average (84-for-283) in12 starts against divisional opponents ... On Aug. 30 against Philadelphia, allowed one hit in 7.2 scoreless innings and took a no-hit bid into the eighth inning as heoutdueled Philadelphia's Roy Halladay in the Dodgers' 3-0 win ... also picked up his first hit of the season in his third at-bat thatnight after starting the year 0-for-45 at the plate ... Tied his career-long winning streak with three straight victories from May 2-18, going 3-0 with a 3.38 ERA in four starts. Went 12-8 with a 3.56 ERA in 26 starts, including seven complete games...made his fifth consecutive Opening Day start for the Carp...registered his 100th career win on July 14 against the Yomiuri Giants at the Tokyo Dome...struck out 123 batters in 179.2 innings. October 30, 2014 RHP Hiroki Kuroda elected free agency. 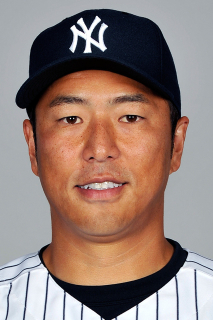 December 7, 2013 New York Yankees signed free agent RHP Hiroki Kuroda. 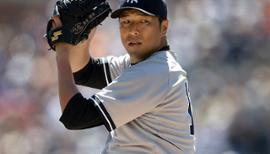 November 20, 2012 New York Yankees signed free agent RHP Hiroki Kuroda. 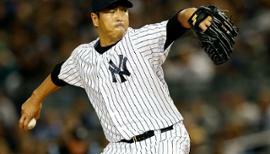 November 3, 2012 RHP Hiroki Kuroda elected free agency. 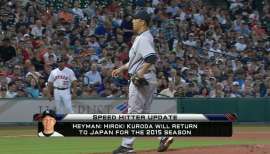 January 26, 2012 New York Yankees signed free agent RHP Hiroki Kuroda. 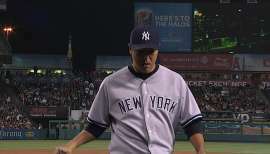 October 30, 2011 RHP Hiroki Kuroda elected free agency. November 15, 2010 Los Angeles Dodgers signed free agent RHP Hiroki Kuroda. November 7, 2010 RHP Hiroki Kuroda elected free agency. October 15, 2009 Los Angeles Dodgers activated RHP Hiroki Kuroda. October 7, 2009 Los Angeles Dodgers reassigned RHP Hiroki Kuroda to the minor leagues. September 6, 2009 Los Angeles Dodgers activated RHP Hiroki Kuroda from the 15-day disabled list. September 1, 2009 sent RHP Hiroki Kuroda on a rehab assignment to Inland Empire 66ers. June 1, 2009 Los Angeles Dodgers activated RHP Hiroki Kuroda from the 15-day disabled list. May 22, 2009 Los Angeles Dodgers sent RHP Hiroki Kuroda on a rehab assignment to Inland Empire 66ers.